Winner-Option.com is another new binary options label on the market and in our opinion it is worth checking out, although it is evidently another white label of SafeCap Investments, which, through their base in Cyprus parent numerous other forex and binary options brokers. 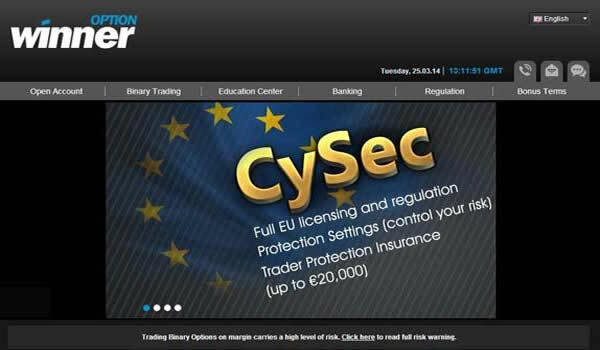 Since it is headquartered in Cyprus, Winner Option is regulated by the local regulator CySEC, and as its regulator is EU based it also complies with the requirements of the EU’s MiFID regulation. Moreover, it is also subject to limited regulation by the UK’s FCA, which is another advantage offering extra confidence for prospective clients, although it would have been preferable if the firm had a full license status in the UK as well. Does the fact that this brokerage is a new offspring of the industry mean that Winner-Option.com is a loser? Well, off course, but it doesn’t mean that trading through WinnerOption means a definite win for traders as well. However, at first glance the trading environment is user friendly, fresh and hassle free and it comes against the extra confidence provided by the fact that this a regulated broker, which traders should be able to trust better than if it was not. However, before opening an account regulation is only one aspect you should consider as other factors could be equally important such as the range of tradable assets offered, the expiry times and trading tools available, the customer support level and most importantly, discerning whether you get your money back when it is time to withdraw your profits. To take advantage of our exclusive bonus, simply open an account on winner-option.com by clicking on the link above. Our bonus offer will be automatically acquired. 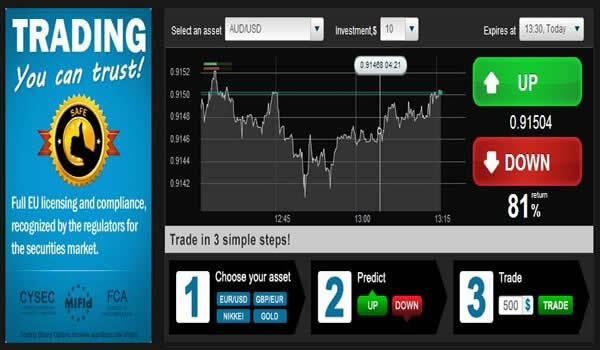 With a tradable menu of assets across all the four major asset categories of currencies (forex pairs), commodities, stocks and global indices, and numbering nearly 200 different assets, Winner Option can be said to score high when it comes to offering several different alternatives to cater for the needs and desires of every individual trader. Moreover, on top of being able to be traded on separately certain of the assets can be paired against each other with the investor being able to bid on which will outperform the other. Of course the assets offering is not equally strong in all assets categories but the overall variety being offered is definitely satisfactory and above the industry average, providing a lot of opportunities for successful profit making. Winner-Option.com could claim to be one of the more progressive brokers around since it operates from a platform which is easy to use and understand, but which at the same time offers customers extensive features to enhance their trading experience, while it also offers the opportunity for trading on the go via a mobile platform which can be accessed via any smart phone device. The platform itself is intuitive and packed with added features and tools, including the ability to easily keep track of ones trading history, to better monitor progress and avoid past mistakes. Three different account types are available to traders, all of which are commission and other fees free. They are the Starter, Pro and VIP account types and for a different minimum amount they offer traders different promotions, tools and features, depending on the amount one is willing to commit to trading. Depositing with Winner Option is super easy since there are over 40 deposit methods being accepted, ranging from numerous debit and credit cards, to bank and wire transfers, as well as multiple on-line wallets such as Skrill and MoneyBookers. The minimum deposit is only $100, while the minimum trade is $10, which could come in handy especially for beginners who lack the confidence and experience to initially place high trades, as well as for those on a limited budget. Accounts can be denominated in a wide range of currencies including USD, EUR, GDP,CAD and AUD to name but a few. Withdrawals are also easy and convenient to make as there is no fees or minimum withdrawal amount, while withdrawal requests can be submitted whenever a client wishes. However, the withdrawal processing will only take place after a trader’s identification has been verified and approved, while the maximum withdrawal amount is equal to a trader’s current account balance. Winner Option as well as other Safecap operated brokerages offers attractive and generous bonuses to traders, subject always to certain terms and conditions, especially when it comes to when and how the bonus money can be withdrawn (generally speaking only after a certain predetermined trading volume has been achieved). Currently Winner Option runs a “Special 100% bonus Promotion” campaign which will expire on 31/12/2014, under which new customers who open an account with Winner-Option.com shall receive a 100% Bonus for a minimum deposit of $/€/£ 200, provided that the bonus amount will not exceed $/€/£ 2,500. A selection of different trading methods are available through the Winner Option platforms which are designed to cater to the preferences of each trader. Besides the classic Put / Call binary option where users simply speculate on whether an asset will go up or down over a given time span, there is also one touch, touch/no touch, ProOptions and Speedmaster. The Speedmaster is essentially the 60 second option which can lead to super fast profits, the one touch option can offer payouts of up to 500%, while the ProOption method is where you will find most of the bonus features which include double up, rollover, buy out and binary builder style options . These different trading methods provide some more exciting and potentially more lucrative alternatives when compared to the more traditional types of binary options trading. In an effort to facilitate the trading experience of traders and make it more feasible especially for the rookies to place successful trades, Winner Option offers an extensive educational center, through the very enlightening material they provide via their Trading Academy, where account holders can watch any of the many video tutorials, use an interactive e-book and listen to the in-depth course which is suitable for beginners and advanced traders as well. The customer support level aims to be impeccable and is available 24/7. Traders can reach the support team through Live Chat, Email or telephone. Specifically for the telephone support, toll free numbers are available in 9 countries, while customers in an additional 14 countries are serviced through dedicated local numbers. Lastly, the site is available in 7 different languages, making it easier for traders to trade in their native language and thus removing from the trading experience any difficulties associated with language barriers. This binary option broker is definitely worth checking out. Yes, it is a white label and cannot claim that it has re-invented the wheel when it comes to binary options trading. However, it is based on a user friendly, reliable and sound platform packed with added features. Moreover, the wide variety of tradable assets as well as the different account and trading type options will most definitely please the needs and requirements of almost every trader, while its generous bonus and effective payment and withdrawal procedures help it to stand out from the average run of brokers. Due to these and other reasons Winner-Option.com is gaining popularity and despite its young age and short track record in the binary options world, it is already making a name for itself in the binary options industry and can be said to be well on its way to leading the pack sometime in the future.